I had my turn at samesies- now it’s his. P.S. Would you look at those hairlines? No doubts about paternity here. Olive was asleep when we left the farmer’s market, so we just kept driving. We pulled into the abandoned convent after a half hour winding our way through quiet Sunday streets, looking at houses and stopping in front of the ones with for sale signs piercing their lawns. 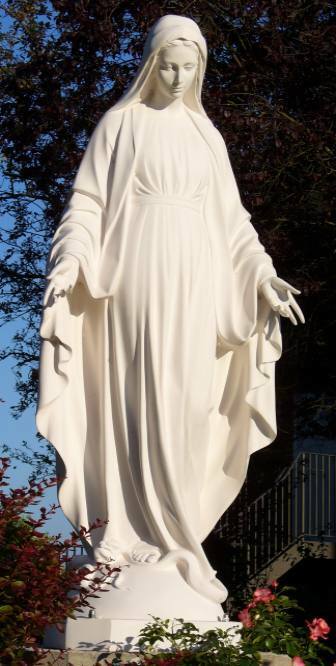 The house was empty and silent, a Virgin Mary statue stood in the front garden with open arms, eyes downcast. I sat still as Adam described the house to me, walked me through the interior with his words, explained what each window looked in upon, where each door opened. Towards the end there were only two nuns left. And now they’re gone, too. I sat still and wondered what would make someone become a nun, turn their lives over to the Church. I wondered what it felt like to hide your hair beneath heavy cloth, turn your back on love and give your heart to a faceless name. An idea, an ideal. To know that your life began and ended with you. Full stop. I wondered about the strength of these women, the all-subsuming sacrifice they made. The hours of prayer and quiet. The service and devotion. I wondered if they had doubts. We all have doubts, don’t we? I looked at Mary standing still in the garden, arms outstretched and palms turned upward. I tried to meet her gaze but her eyes were downcast. I tried to hear her speak but her mouth was still as stone.